My name is Asim Mian and I will be running my third Boston Marathon in April as part of the Credit Unions Kids at Heart team. I could not imagine a better, more motivating cause and am honored to be running again this year for my patient partner Vraj. Vraj is an amazing and inspiring seven year old boy. 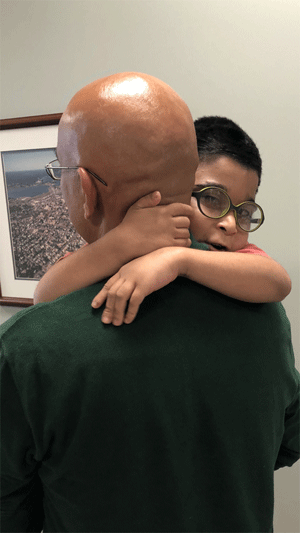 Vraj was born prematurely with a rare genetic chromosomal deletion depletion syndrome which resulted in a number of conditions including brain leucoplasia, cerebral palsy, reactive airway disease, global developmental delay, visual and hearing impairment, and seizures. Though non-verbal, Vraj use's his facial expressions and gestures to communicate and express himself. And despite his many health uncertainties, Vraj, with his remarkable spirit, is defying all odds and making progress as his mom so beautifully says "at his own pace and shining through it all"! Vraj is now a second grader at the LABBB collaborative school in Burlington, MA where he is thriving. For my wife Amy, my son Daniyal, and I, being a part of the CU Kids at Heart family has been immensely rewarding. We have loved getting to know all the patients, their families and runners involved over the past year and are all gearing up for 2019! I can think of no more important cause to support than the remarkable, tireless efforts of the doctors and researchers at Children's Hospital on behalf of Vraj and so many other children and families whose lives their work and care touches in such critical ways. One hundred percent of the funds we raise for the CU Kids at Heart team go directly to support five research programs: Moyamoya disease, Sturge-weber Syndrome, Cerebral Palsy, Pediatric Epilepsy, and Pediatric Brain Tumors. This means that every dollar raised makes a real difference- a new clinical trial, a new researcher, a new breakthrough, a cure. Each year seeing Vraj waiting for me on the corner of Hereford and Boylston streets – whether in intense heat or driving rains—is indescribable and gives me that final push to cross the finish line. Thanks to the generous support of so many of you, we have been able to exceed our fundraising goal to support Vraj and the many patients at Children’s the CU Kids at Heart team supports. I very much hope you will consider supporting Vraj and me again this year and cheering for us loudly on Marathon Monday, April 15.